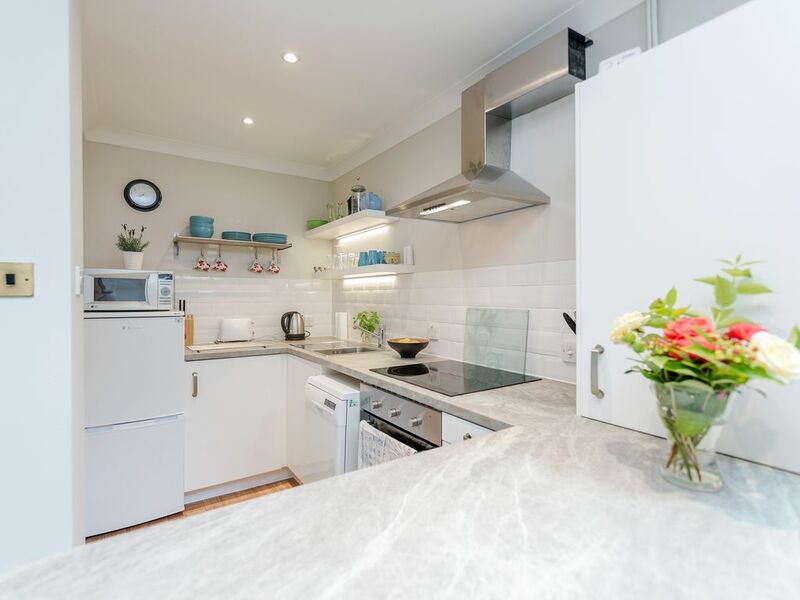 A one bedroom self -catering apartment, recently renovated and decorated in contemporary style in a very central position in this historic city of Winchester. The apartment is next to the park and leisure centre and is a few minutes walk to all the sights of Winchester and the shops, bars, restaurants, etc.. The railway station, with direct trains to London (1 hour approx) is about a 5 minute walk. The apartment consists of a double bedroom, bathroom with shower, sitting room with a large, comfortable sofa bed and with kitchen area off it. It is fully equipped with dishwasher, washing machine, oven and hob, microwave, etc., as well as flat screen smart TV, DVD player, broadband internet access. The apartment benefits from its own parking space which is unusual in Central Winchester and small communal garden. There are 3 apartments available to rent, prices listed here are for Flats 2 and 4, Flat 1 is slightly larger and quieter than the others and is slightly more expensive, please enquire for prices in Flat 1. Please note if an apartment is shown as booked it is always worth enquiring with us as we may have one of the others available to book. We own and manage all our properties and have been running self catering holiday homes for over 15 years, living locally we are on hand to help with any problems or give information about the local area for our guests. Park House is perfectly situated in the City Centre with the additional benefit of off street parking available. It is also close enough to the bus and train stations to be car free! To be able to stay in the centre of this historic city and also if needed to have off street car parking available. 3 apartments available so if an apartment is shown as booked we may well have another one available, so please do ask anyway! Corner sofa bed which converts to large very comfortable bed. Flat 2 may be wheelchair accessible as is on the ground floor with no steps apart from the small ledge at the bottom of the front door. Park Place had it all, location, well equipped, clean. We enjoyed our stay at Park Place. It was a very short walk to the center of town to shop, close to the bus park (we had decided not to rent a car), and not far from the train station. We had loads of restaurants, stores, and bakeries to choose from and Winchester Cathedral was about 4 city blocks away. The owner, Caroline, was most helpful and we would go back there anytime. A modern and comfortable temporary home, well-equipped. Very helpful and attentive owners. The wifi was free and reliable. The property is very central and the dedicated parking space a major benefit. All in all an excellent choice which made our visit to Winchester and our trips to the many attractions within a day's drive all the more enjoyable. We are pleased you enjoyed your stay and hope to welcome you back if you are in this part of the world again! The owners, David and Caroline, were on hand to give us any support we needed. We walked into the flat and immediately saw the roses and chocolates that they had left for us. What a lovely touch! The flat is close to the High Street, the bus station and the rail station. There is a bus stop very near to the flat that goes to a big Tesco for groceries. As we didn't have a car, this was most helpful, although just a few minutes down Middle Brook Street is a Sainsbury's and a Marks and Spencer with a food hall. There are lots of interesting shops in the pedestrianized High Street. Most of the tourist sites are within walking distance - the Cathedral, the Great Hall with the Round Table, the Mill, the Abbey Gardens. We took some day trips using the local buses. Fantastic Apartment, great location, very clean, owner very obliging and contactable. Beautiful apartment close to the city centre. A really pleasant stay in a lovely modern and well maintained apartment that is in a quiet location only a short walk away from the high street, Cathedral etc. On arrival the property was easy to access (there is off-street parking) and Caroline was contactable via phone and email throughout our stay. The 'Garden Flat' is very well presented throughout and the patio doors in the bedroom lead to a pleasant shared garden area. The kitchen is well stocked with crockery and cooking utensils although there are plenty of very good restaurants just a stones throw away! If visiting Winchester again would definitely stay here! Thank you for your kind review, we are glad you enjoyed your stay and hope to welcome you back again in the future. The flat is very confortable with a beautiful View. It is 5 minute at the centre of Winchester. We found the flat clean and well maintained. I recommend this property who wants to visit Winchester. The owner has provided to us everything we wanted. We spent 15 days in relax. Winchester is a very central base for exploring Southern England. From Winchester it is a short drive to the south coast, New Forest, Bournemouth, Portsmouth, Isle of Wight, as well as Salisbury, Bath, Oxford and Brighton which are all less than an hour and a half from Winchester. London is an hour on the train or just over an hour by road. There are many pretty country villages around Winchester, with many river and downland walks from the city centre. The apartment is perfectly situated for exploring Winchester by foot. The location for Downton Abbey is close by as is Jane Austin Country. Please note the rates shown are 'from' the rates will depend on length of stay, number of guests and time of year. Also The Garden Apartment is more expensive than the other two apartments as it is quieter and slightly larger. Our rates include all electricity, gas, linen, wi fi, parking, if you want an end of stay clean to be arranged, this can be taken from your security deposit. If you decide to book through Homeaway direct you will have to pay the fees charged both by them and by PayPal both of which will be added to your payment. Payments direct with the owner will not be charged these fees. Once the deposit is paid it is non refundable.